Is the Expanded Universe creeping into Episode IX? Ever since Disney’s brand new Star Wars Galaxy’s Edge park was announced Star Wars fans have been dying to get a glimpse at the under construction parks and now (via Disney Parks) they can! The official Disney blog shared this incredible video of a drone flying over the new addition to Disneyland and even in the early stages it looks utterly epic! For those of us who grew up with Star Wars the classic (around) 4″ Kenner toys! The uber popularity of the toys meant that for many of us the only version we could get were dodgy bootleg ones! And in the newest Star Wars novel Last Shot by Daniel Jose Older, there is a cameo from one of the most famous bootleg Star Wars toys Uzay Sava?cilar?. As we move ever closer to the release of the newest Star Wars movie, Solo: A Star Wars Story, fans are finally beginning to get really excited about the backstory of the galaxies favorite smuggler. To celebrate the official Star Wars Show sat down with writers Lawrence and Jon Kasdan to talk about creating the new vision for the classic character. We’ve all wanted to be in Star Wars right? From swinging a lightsaber to venturing on distant planets, there is so much to explore in the Star Wars universe, and now as per Venture Beat you can play holochess on your phone! Yup, the classic galactic game is now available as a free augmented reality experience on your handheld device! After much fanfare it looks like Solo will be released in China on the same day as the US May 25th. The Hollywood Reporter revealed the news, which is rather unusual for a big blockbuster. The film will be premiered ten days before at Cannes film festival which means that the review embargo will drop at the same time, hinting that Disney is very sure of it’s newest Star Wars story. 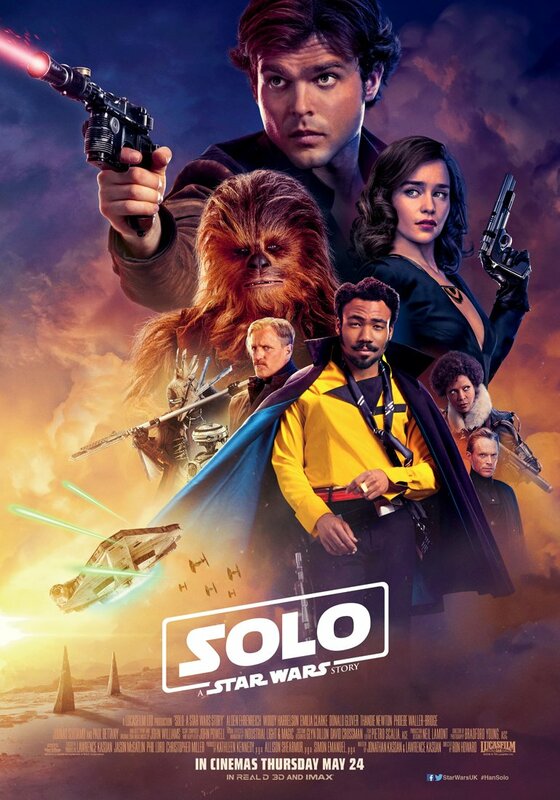 Here’s a lovely treat for you, as a reddit user shared this gorgeous new Solo: A Star Wars Story poster with Donald Glover’s Lando Calrissian front and center. The galactic poster has some lovely cosmic clouds behind the ensemble and leans heavily into the film’s seventies aesthetic. Ever wanted to cruise with galaxy with your fave Star Wars characters? Well now you can (sort of) as Disney recently announced that their cruise line would be doing a Star Wars Day at sea! In a new video Disney parks director talked about the brand new Star Wars day at sea experience, and gave interested fans a hint of what they could expect! The Star Wars Expanded Universe has long been one of the most beloved parts of Star Wars (kind of) canon, and Luke’s wife Mara Jade one of the favorite characters. Which is why the internet lost its collective mind over the announcement of a casting call for “MARA” in Episode IX. The Hashtag Show exclusively revealed the callout, and though we’re sure it’s just Abrams trying to get tongues wagging…we can’t help but dream. As The Last Jedi showcased, BB-8 can really do anything and as Nerdist reported that also includes dental work! As a young BB-8 cosplayer pulled out her wobbly tooth with a BB-8 spin master toy, there was a slight malfunction as the BB-8 began to spin around on its own, but the tooth was eventually safely removed! That little droid really can do everything! There’s been a fantastic trend recently of people organizing to help young people get the chance to see their favorite movies. The newest attempt is focused around Solo: A Star Wars Story, as ReelOutreach are trying to raise money for local kids who might not be able to afford it otherwise to go and see the newest entry of the saga in a galaxy far far away. You can support their mission right here! Some gorgeous new Solo: A Star Wars Story art work has been revealed via @Markomanev on instagram, and the streamlined illustrations have gotten us even more excited for the upcoming entry! More beautiful instagram art via @matttaylordraws this time harking back to the classic trilogy for May 4th, and we are obsessed with this beautiful reimagining. Ron Howard was on the press trail for Solo: A Star Wars Story on May 4th, as he made an appearance on the Late Show to chat about his experience crafting a story about one of the most beloved and iconic characters in cinematic history! Ron Howard was also on Good Morning America, talking all things Solo: A Star Wars Story, so if you’re a Ron Howard fan, a Star Wars fan or even better BOTH, then May 4th was a great day for you! May 4th is a massive day of celebration for Star Wars fans everywhere, and Shop Disney was there with some gorgeous merch to celebrate including this beautiful now sadly sold out pin. The cute enamel pin showed R2D2 projecting his message from Princess Leia via a holographic design and frankly it’s just lovely. If you’ve ever wondered just where the May Fourth celebrations came from then luckily Inverse did a deep dive into the history of the now synonymous unofficial Star Wars celebration that actually began in Toronto! Every May 4th fans celebrate their favorite galaxy far far away, and this year English airport Heathrow got involved, with an incredible display including flights to all kinds of planets from the Star Wars universe including Chewbacca’s home planet of Kashyyyk!! Obviously we all love Star Wars swag, and if you’re near an Alamo Drafthouse cinema you can grab one of these rad exclusive Mondo Solo themed cups when you buy a ticket to the movie! Ever wanted to relive the moment where Boba Fett fell to his gruesome (sort of) death in the Sarlacc Pit? Of course you have, and now you can do it in the form of this very fancy coffee table from dudeiwantthat dot com! It’s the perfect outrageous gift for the Star Wars fan in your life, or just… yourself. Ben Schwartz has taken to twitter to finally reveal that he played a Stormtrooper in The Force Awakens, but he doesn’t want you to tell everyone’s favorite little rotund droid BB-8!